Ok, Are you ready for this? Throughout the years of detailing other homes and my own, I’ve accumulated a few tricks of the trade you might say, that are great shortcuts to make cleaning go a LOT quicker. I’ve listed out the few hacks that I use the most below. You’ll notice that I use white distilled vinegar for quite a bit, because it’s one of my all-time favorite natural cleaners. It cleans, sanitizes and deodorizes all at once! Use frozen vinegar cubes with a piece of lemon in them to clean out your garbage disposal. Doing this about once a month is recommended and it’s a cheaper alternative than buying a garbage disposal cleaner at the store! Have you ever spent forever cleaning all the hard, sticky gunk out of your microwave? Well, no more! Take microwave safe measuring cup filled with 1 cup of water and some lemon juice. Place in microwave and heat for 5 minutes. Remove with over mittens, as the mixture will be very hot! Use a damp sponge to clean the now loosened up particles. You’d be surprised how much bacteria is housed in your makeup brushes, that if not cleaned, just end up right back on your face! I typically just squirt some dish soap on the bottom of the sink, wet the brushes and swirl around vigorously in the soap. 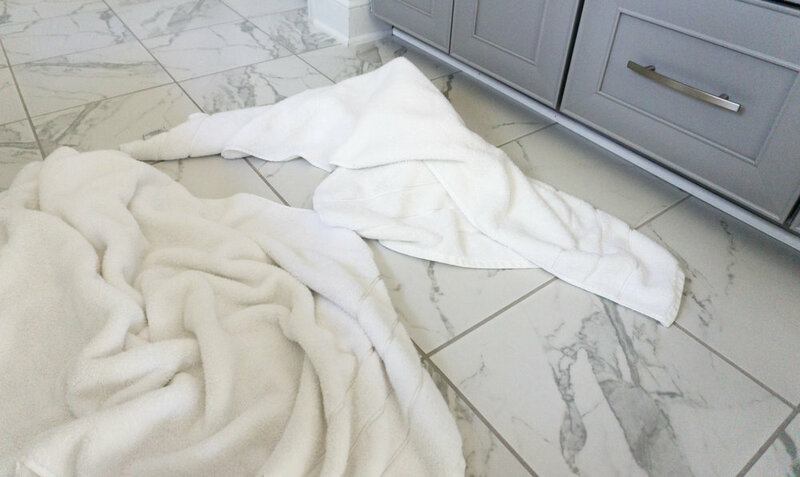 Rise and dry with an old towel that you’re not afraid to stain. Try to get them as dry as possible as to not house any additional moisture or bacteria as it’s drying. I recommend cleaning you brushed at least once per month. Remove the shower head and place in a plastic ziplock bag filled with white distilled vinegar. Let soak for 1-3 hours, then rise and use a sponge to take off any loose residue. This should ensure that any hard water built-up over time is easily removed, leaving you with a sparkling fresh shower head again! One of my biggest tricks is way more simple that you probably think! Once I finish with a regular cleaning, I dry the bathtub or shower, then wipe it with a piece of dry paper towel for any residual soap scum or water marks. Sometimes you have to wet it just a tad to ensure you’ve got it all! Stinky Bath or Kitchen Towels! After significant use, your bath towels start to get dingy and a little stinky. You can keep loading up on detergent and fabric softener but it likely won’t take out the stench! Throw the offending towels into the washing machine with ½ cup baking soda, 1 cup distilled white vinegar and a sprinkle of laundry detergent. Wash on a HOT cycle and immediately transfer to the dryer to dry. First, run a cycle with a dishwasher safe cup filled with about a ½ cup of vinegar. Once this cycle finished, sprinkle some baking soda on the racks and bottom of your dishwasher and run another cycle. And voila! You have a sparkling clean, sanitized dishwasher ready for use. I’m always shocked by the number of people who don’t do this! Shower curtain liners get gross quick and it’s more simple to clean than you think. Once I start to see that I’m getting some build up on the shower curtain liner, I’ll toss it in the washing machine by itself. I typically put in about ½ a cup of vinegar and just a tad laundry detergent (more for the good smell than anything) and wash it on the gentle cycle. I hang it back up on the shower to dry - just be sure it’s not sticking right up against anything or it won’t have room to breathe and dry.